A web comic of romance, sarcasm, math, and language. This week: How long would humans last in a robot apocalypse? 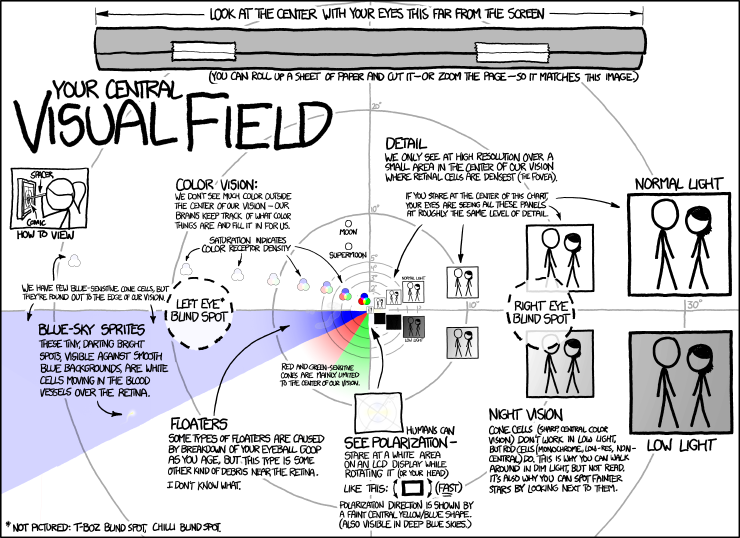 A large title in the upper left of the quadrant reads “Your Central Visual Field.” Below the title, on the left, is a panel with a drawing labeled “How to View.” The drawing is a side view of a pony-tailed stick figure holding a rolled up piece of paper like a straw and using it to space the distance between her forehead and a view screen displaying this XKCD comic. In the center of the quadrant, a caption reads “Color Vision: We don’t see much color outside the center of our vision–our brains keep track of what color things are and fill it in for us. We only see at high resolution over a small area in the center of our vision where retinal cells are densest (the Fovea). Beneath the caption, seven copies of the same panel, a drawing of two stick figures standing close together, radiate out to the right. The panels, labeled “Normal Light,” start out tiny at the center and double in size at approximately each degree marking. The Lower Right Quadrant has the same repeated drawing radiating to the right, but with a much darker background and labeled “Low Light.” These panels look almost black at the center and lighten as they get farther out.